Маленький Английский Avant-Garde Jazz Лэйбл (London). Цена дисков высока (ориентировочно 19у.е. в Москве). Диски характеризует прекрасное качество звучания и оригинальный фирменный дизайн. ACTA 7 Burn, Chris A Henry Cowell Concert Chris Burn, piano. Recorded at Gateway Studios Kingston University on 25/26 July 1993. ACTA 5 Burn, Chris Ensemble Cultural Baggage Jim Denley, flute; John Butcher, tenor and soprano saxophones; Stevie Wishart, violin and hurdy gurdy; Phil Durrant, violin; Marcio Mattos, cello; John Russell, acoustic guitar; Chris Burn, piano; Matt Hutchinson, synthesizer and electronics. Recorded at Gateway Studios Kingston Polytechnic on 11/12 August 1990. ACTA 12 Burn, Chris Ensemble Navigations Jim Denley, flutes; John Butcher, tenor and soprano saxophones; Rhodri Davies, harp; Stevie Wishart, violin and hurdy gurdy; Phil Durrant, violin; Marcio Mattos, cello, double bass; John Russell, acoustic guitar; Chris Burn, piano; Matthew Hutchinson, synthesizer and electronics; Axel Dörner, trumpet; Mark Wastell, cello. Recorded at Gateway Studios, Kingston on 17/18 September 1997. WOW 01 BUTCHER, JOHN CAVERN WITH NIGHTLIFE 29/11/04 Weight of Wax Records. John Butcher, tenor and soprano saxophones; Toshimaru Nakamura, no-input mixing board. ACTA 6 Butcher, John 13 Friendly Numbers John Butcher, soprano, tenor and baritone saxophones. Recorded at Gateway Studios Kingston, between March and December 1991. ACTA 3 Butcher/Denley/Mattos/Burn Embers Live Jim Denley, flute, piccolo, alto sax, voice; John Butcher, tenor and soprano saxophones; Chris Burn, piano and percussion; Marcio Mattos, cello, Dod digital sampler. ACTA 10 DURRANT, PHIL SOWARI 03/11/97 Phil Durrant, violin, live electronics. 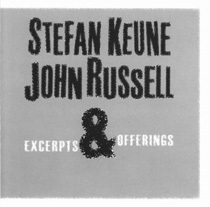 ACTA 14 Keune/Russell Excerpts & Offerings Stefan Keune, sopranino saxophone, alto saxophone; John Russell, acoustic guitar. ACTA 11 KLAPPER, MARTIN/ROGER TUR RECENT CROAKS 19/10/98 Martin Klapper, amplified objects, electronics, toys, tapes; Roger Turner, old Amati drum set, certain percussion, toy piano. Recorded on 30 July and 1 August 1997 at Delta Studio, Prague. ACTA 13 Lunge Braced & Framed Gail Brand, trombone; Phil Durrant, violin, electronics; Mark Sanders, drums, percussion; Pat Thomas, keyboards, electronics. Recorded live at Moat Studios, London on 17/18 February and 22 July 1999. ACTA 4 Malfatti/Butcher/Durrant/Lovens/Russell News From the Shed John Butcher, tenor and soprano saxophones; Phil Durrant, violin and electronics, Paul Lovens, selected drums, cymbals and saw, Radu Malfatti, trombone, zither and accessories, John Russell, acoustic guitar. Recorded at Wood Wharf Studios on 22 February 1989. ACTA 8 SPONTANEOUS MUSIC ENSEMBL NEW DISTANCE 31/12/95 John Stevens, drum kit and pocket trumpet; Roger Smith, Spanish guitar; John Butcher, soprano and tenor saxophones. ACTA 9 WESTON, VERYAN PLAYING ALONE 11/10/99 Veryan Weston, piano. Recorded at home in Hertfordshire, Spring 1993.